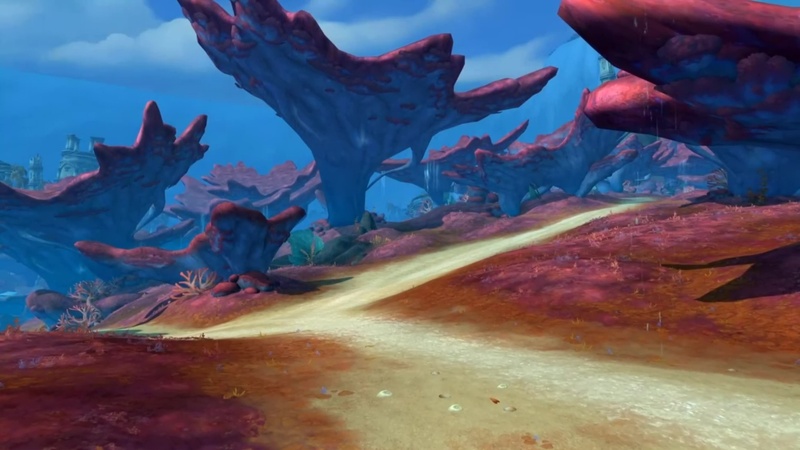 Now let’s take a quick look at our first zone: Nazjatar. 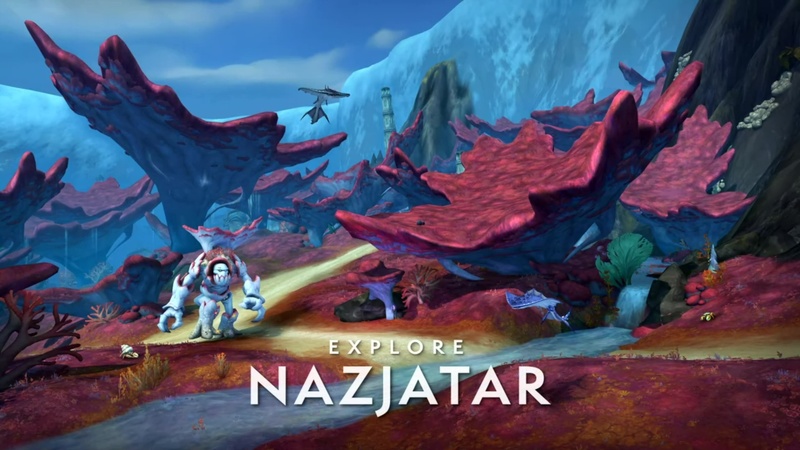 Nazjatar is this gorgeous formerly-underwater area that include both these beautiful wild life areas of kelp and coral; as well as the ancient night elf civilization of the city of Zin-Azshari that was ruined and sunked long ago. 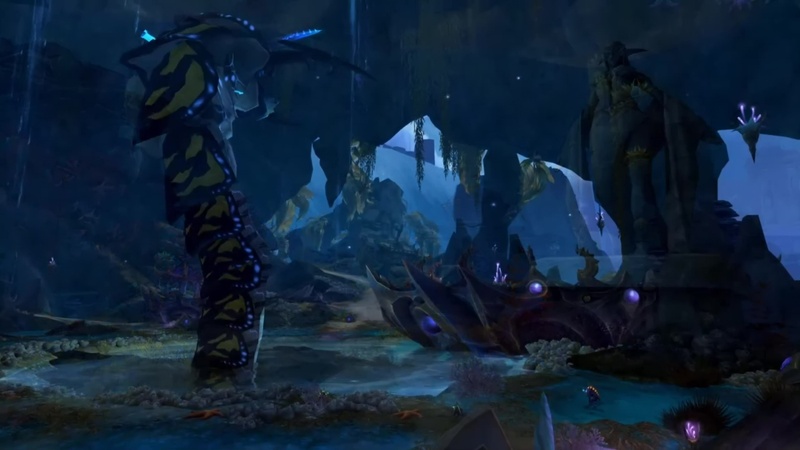 You will also make your way down deep into the deepest parts of Nazjatar where you will find the naga fortifications. This is our first time showing the deepest parts of naga architecture, that leads all the way up to the Eternal Palace itself. Now we are doing a few new things out here in Nazjatar. First, one of the ways that you can level up your power in Nazjatar is through a system we call Combat Allies. 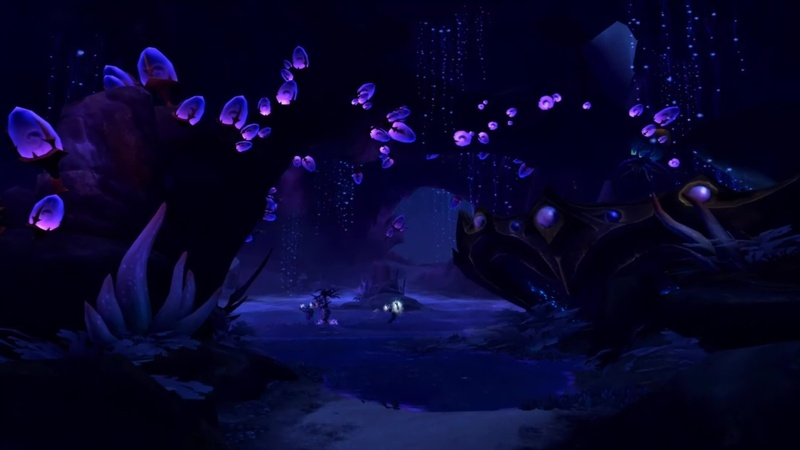 When you head down into Nazjatar, the first thing that you are going to notice is that Azshara has laid a trap for you; and we are going to have to skirt a huge naga army and find our way through dripping caves, and caverns to try to avoid her forces until we gain some more power. Most of our troops are dead or dying after the catastrophe that starts this whole experience. Down here, both sides are going to meet brand-new allies. The Horde are going to meet a group of former naga slaves made up of the Girblin, the Makrura, and the Sea Giants. They call themselves the Unshackled; and the Alliance are going to be helped out by a group of deep-water warriors called the Ankuran. Both sides hate the naga for a variety of reasons, and we are going to help them build up their bases in order to attack back. One of the ways that we can build up our forces here is with our Combat Allies. This is a system where you can take out one of three different allies to head out with you to adventure during the day. Combat Allies can get experience by completing world quests, killing rare spawns, or doing some of their own daily quests that will unlock whenever you take one of them out with you. As you level up your Combat Ally, they will gain new abilities, and eventually unlock other cosmetic rewards for you. 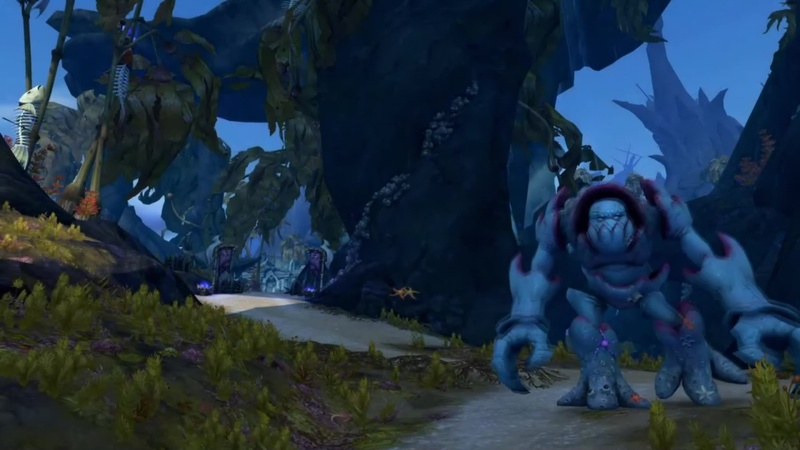 You have three different Combat Allies you can take out in Nazjatar with you; and they each have 30 levels. 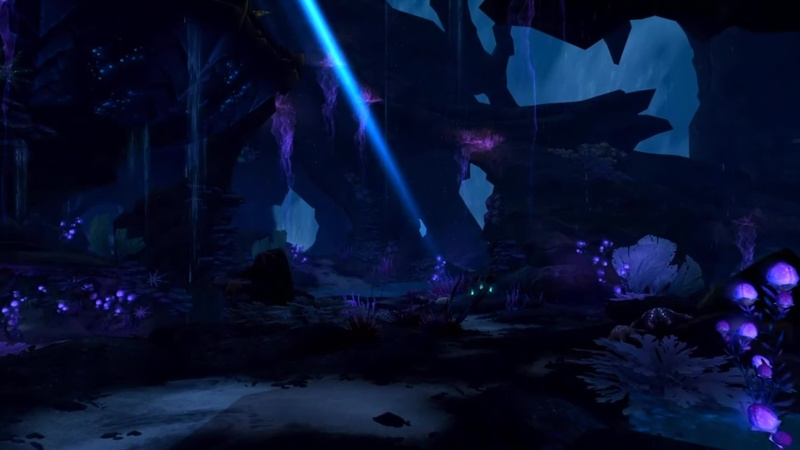 So there is a wide level of different progression that you can get just for questing down here in Nazjatar. But it is not all about bringing a buddy out with you. We are also making some changes to how we view world quests and daily quests in this zone. 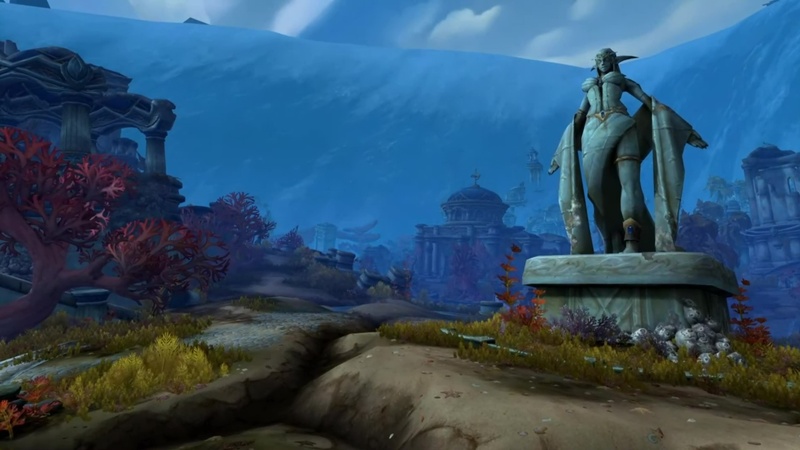 Nazjatar will have an emissary; but all the world quests are heavily themed around Azshara and Nazjatar itself. If you see a rare spawn or rare elite world quest show up, it is a Naga champion sent by Azshara. It has a powerful Azshara-related affix. So every time you see it, it is going to feel a little bit different to fight. They also take over an area, and bring with them base defenses. This is one way in which we want to make it feel like all of these champions — when they come down into the world, really have an impact on their area. You will also find other world quests that are unlocked here through a series of questlines related to the former denizens of Zin-Azshari. This are just some of the ways that we are trying to change up, how the world quests system works in this area, and we will talk about other ways that we are doing in Mechagon in just a little bit. Another one of those things that we are focusing on is taking a lot of those background activities and putting them around your hub as sort of a daily system, where you can login, you can gather some quests that will have you performing a variety of different kills, and collects, and other activities around the zone before you head out to adventure for the day. 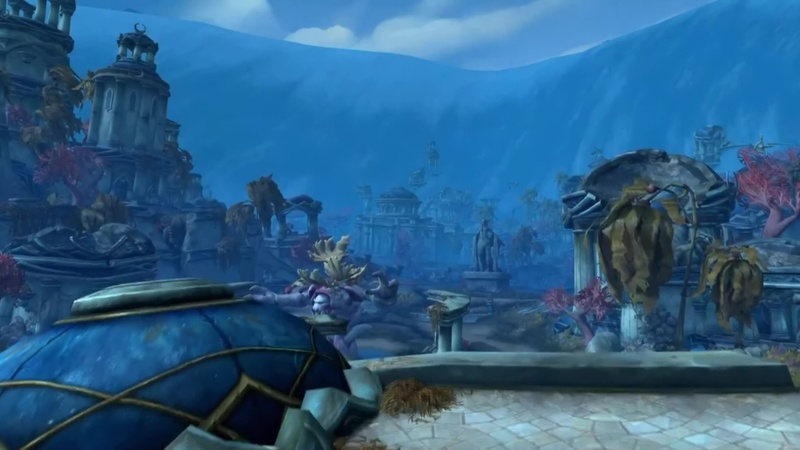 So you can always feel like you are being efficient, but also everything comes back to building up this hub and building up our forces so we can take the fight to Azshara. The main questline of this zone takes us through building up these guys, and getting down deep into the naga areas; and figuring out what exactly are their weaponry? What are their defenses; and then how do we counter them? Ultimately, we are going to have to make our way over into the city of Zin-Azshari and gain a powerful artifact called the Javelin of Suramar. 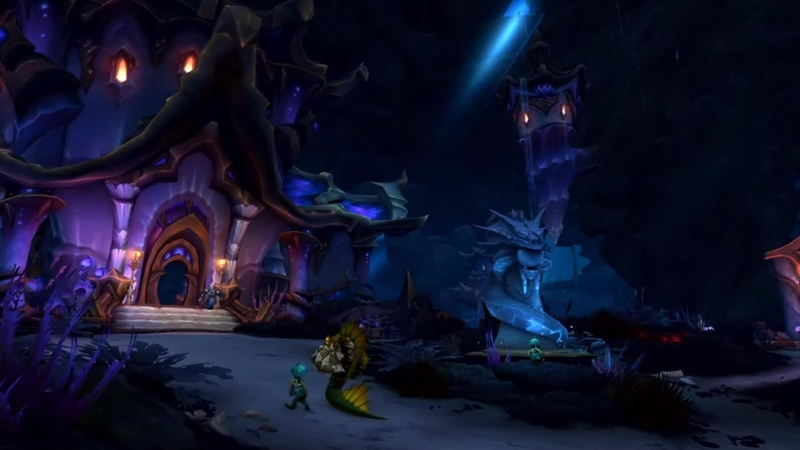 We are going to use this in a climatic finale that breaks open the entrance to Azshara’s Eternal Palace. So let’s talk a little bit about that in a second; but for now let’s take a quick look at a video.